My brother-in-law visited me recently. 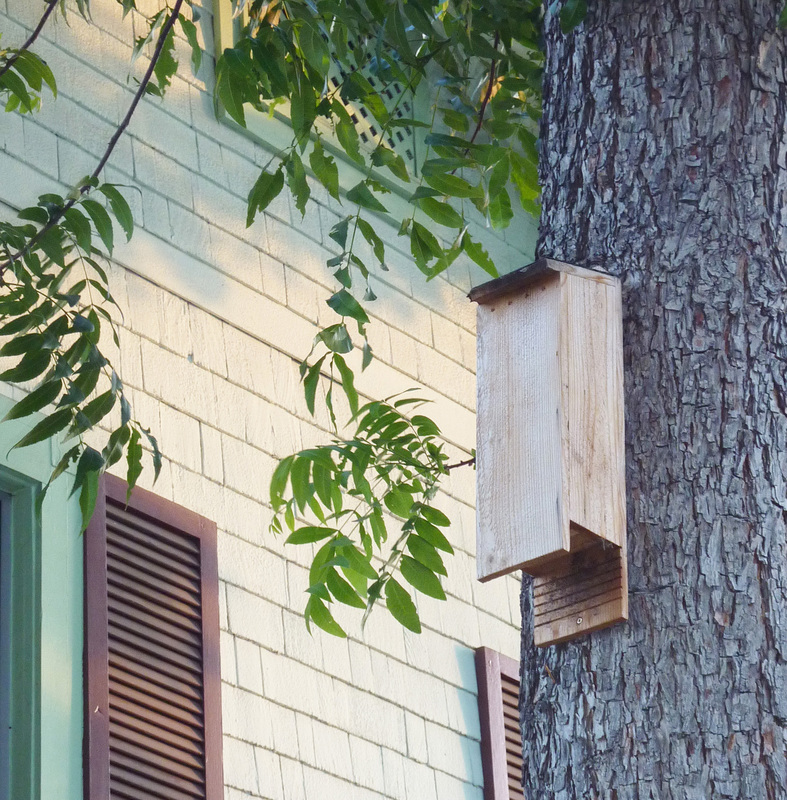 During his stay he excitedly told me about spotting several bat boxes in my neighborhood. Although my initial reaction was, “Bat what?”, I was quickly intrigued about learning whether the bats I’d noticed flitting about my tiny backyard were an urban anomaly or not. Bat Box – photo by Christina Lynch. While some people shudder at the mention of bats, these flying mammals fill several ecological roles. In addition to dispersing seeds and pollinating fruit trees and flowers, bats play an important role in controlling insect populations. Primarily insectivores, bats have the ability to consume more than 600 mosquitos in an hour! Like many species, bats worldwide aren’t fairing well in response to rapidly expanding urban environments. Habitat loss, degradation, fragmentation, diminishing prey, limited access to water, light pollution, and echolocation disruption are some examples of how urban areas can disrupt bats’ ability to forage and roost. Because bats are widely distributed throughout the world and are sensitive to ecological changes, scientists consider them bio-indicators in the study of the effects of/and adaptation to urbanization in a species. The Big Brown Bat. Creative Commons photo by Angela C. Barry. Even as many bat populations are declining in urban areas, scientists are also finding species whose morphology and ecological ‘plasticity’ provide advantages in cities over less adaptive bats. Bats with long, narrow wings, which provide greater lift, are well adapted to the open but unprotected spaces of many towns, feeding efficiently upon insects drawn toward light pollution. Some species are showing adaptions to drinking from artificial water sources such as pools, a favorable behavior in drought-stricken environments such as California. And with the disturbance/loss of roosting habitats – caves, mines, or trees – bat boxes provide opportunities for the tight roosting quarters bats prefer, which minimize the energy required to keep their body temperature stabile while at rest. Mexican free-tailed bats exiting Bracken Bat Cave. Creative Commons photos by the U.S. Fish and Wildlife Service. Of the 27 bat species found throughout California, bats found locally in Southern California include the Western Mastiff, the big brown bat, the Mexican free-tailed bat, and the Canyon Bat. You can learn more about local bats and listen to their calls at KPCC’s “Everything you didn’t know about bats in Los Angeles“.